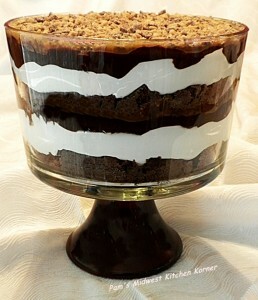 Layer brownie pieces (homemade, store-bought or from a mix), whipped cream, drizzled chocolate syrup & chopped nuts. in a clear bowl. Repeat layers 2 or 3 more times. Garnish with chopped nuts, fruit or crushed candy. This entry was posted in Dessert by Modern Mom Meals. Bookmark the permalink.